Bengal Engineering & Science University, Shibpur has a fairly long tradition of rendering community service in a modest manner besides conducting academic programme. A community service rendered by the faculty members consists of formulation and implementation of specific programmes of technology innovation and technology transfer to the Rural Sector. 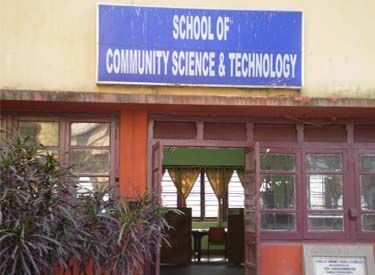 In response to the demand for proper coordination and integration of such activities of the faculty at University level, School of Community Science & Technology (SOCSAT) was created in 2004 at University for facilitating the development and growth of the unorganized sector in our country. The objective of the school is to foster sustainable development of different marginalized communities by empowering stakeholders with inputs from institutionalized Science & Technology Community. The school since then made significant progress in the frontier areas of basic and applied research in juxtaposition with various training programmes that are congruous with the objectives of the school. In this respect various science awareness programmes, several training programme on Advanced Pottery, Metal Art, Batik, Jute diversification including Advance Food Processing & Preservation Technology were organized by this school. The objectives of these programmes are to impart training to the marginalized people especially women Self-Help Groups of Howrah district in order to promote technology and create entrepreneurship. The training on food processing will improve the technical skills and knowledge in the processing of fruits and vegetables to the women of the rural areas and to take up income generating activities. As a result, two SHGs named Suktara and Prayas comprising those women were formed in Howrah District with the initiative of this School.